Can folks suggest Canopy options for TI. Canopy only for when no sail. Options with or without AMA's on. I've seen a few online pics but no info about where the canopy came from. Our SeaCycle we sold came with a generic "Taylor Made" umbrella that worked great. Might still try to use it. We want to be able to have the same "experience" as this setup. Just pooping around, with dogs and not get fried. I like this one, but not sure how much that would really cover on Tandem with Tramps. 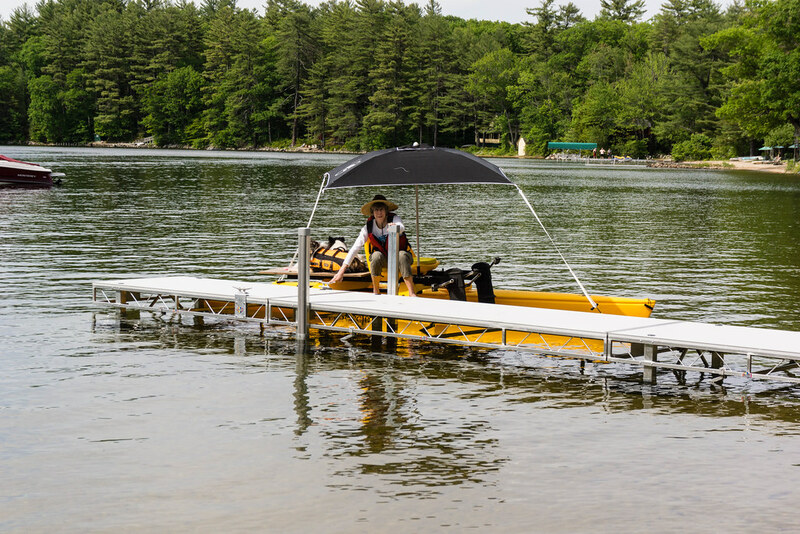 I've seen a few folks use a standard motorboat Sunbrella canopy. I have one from our Motor boat I might try to set TI to accept. Finally did my own thing. Works pretty good. Might get a bigger one. 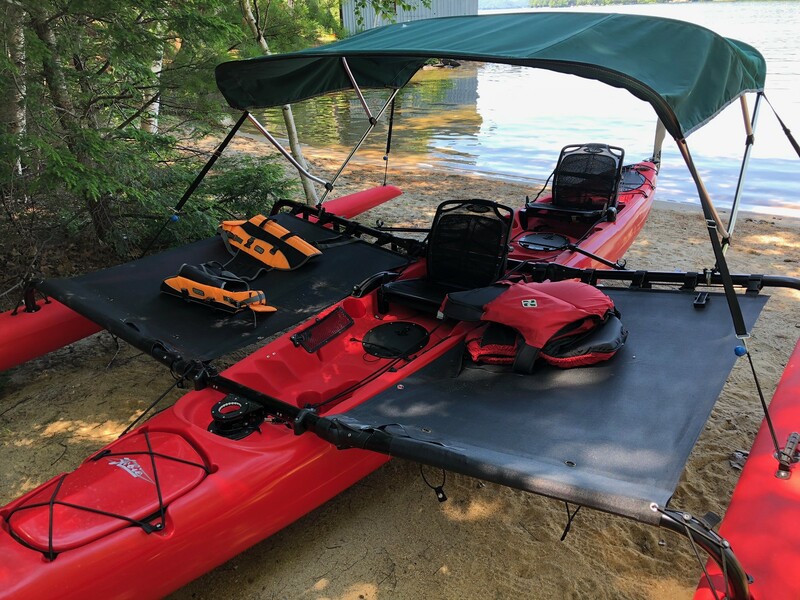 The advantage of the bimini is that they have a high wind rating. The disadvantage is their bulk and lack of side coverage. I’ve been using that four bow bimini 2.4m long x1.9 wide (as seen in your earlier post last pic above) for sleeping onboard but lately have been experimenting with a winged tarp that has much better coverage. It remains to be seen how well it handles stronger winds, but so far it has handled 10-15knots ok. This tarp was a runout and is no longer available but any winged tarp (eg MSR Rendezvous, Kelty Noah etc) should work. Thanks for that video link Chris. It demonstrates well just how easy it is to fit these newer style catenary cut wing tarps to the Islands. In the video it looks quite windy but once the tarp is set up there is no flapping at all. I originally tried a standard tarp, but couldn’t stop it flapping! 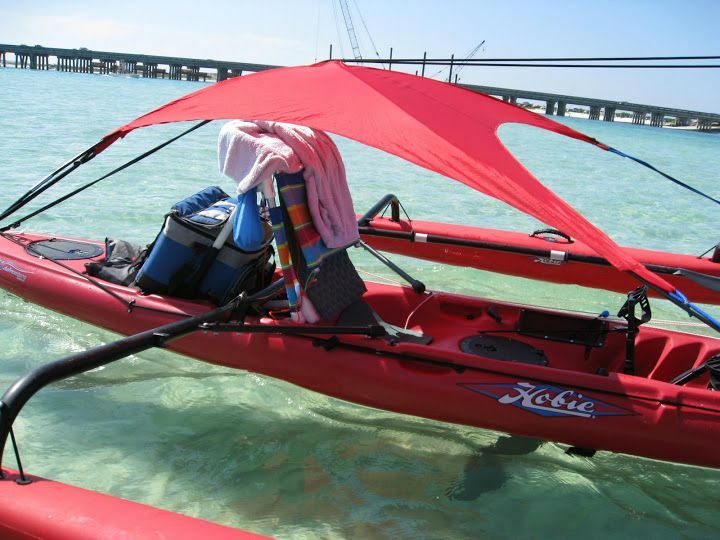 That’s how I ended up with the bimini, but I think the winged tarp is a better solution.